There has been many bits of information out there on the Z31 Coil Over conversion. A lot of this information is Bad Information, Hopefully this will help clear up any confusion on installing a coil over setup in your Z31. The Main issue with installing Coil Overs on the Z31 is the odd use of offset Spindles that the Z31 Uses. People have tried to use the S13 Coil overs find out that the front wheels end up pushed back because of this offset Spindles design. Below I will try to show what this means. 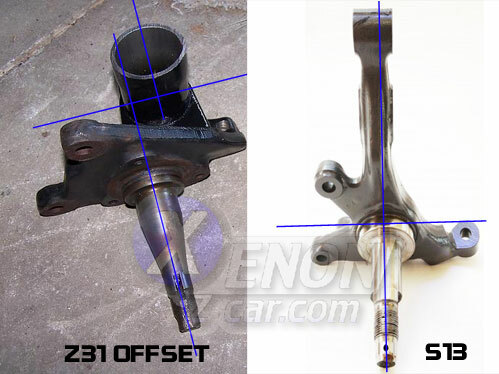 As you can see in the image above, The Spindle on the Left (Z31) has a distinct offset from the strut tube where the S13 Spindle is in line with the Strut Tube Mounts. What this causes is an issue where the wheels are pulled rearward when using a S13 Coil over tube as the top hat is angled differently. Currently there are 3 companies who now make Coil Overs specifically for the Z31 Chassis. They all require welding to the spindle for the front.